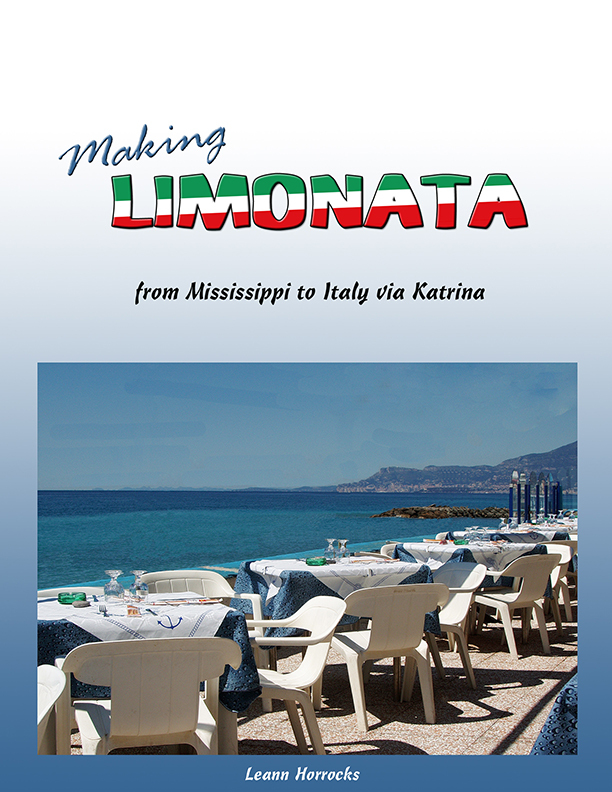 "Making Limonata: from Mississippi to Italy via Katrina" is a new e-book that follows the two-year unexpected adventure of a newly retired couple. Leann and Peter Horrocks of Ocean Springs, Mississippi lost a lifetime of belongings in hurricane Katrina. After settling with insurance companies, they decided to move to Italy and rent for a year instead of buying a new house. Fourteen months after Katrina, they were living in Italy. There's hardly a place in the United States that doesn't have some threat of natural disaster. If you've been hit by one, or if you are in the way of one, you will want to read this. The story starts with Katrina in August of 2005. The couple's situation was complicated for Leann by the fact that Peter had been released from the hospital after major surgery literally hours before they evacuated. The impact of the hurricane itself is shown in compelling photographs, many are before-and-after pictures that show what raging wind and water did to their new home. A lot of helpful information on dealing with the stress of the loss is included. Successfully dealing with insurance companies is also covered, giving you an idea of where to start. These people were not rich. The book shows how the couple decided to go to Italy and what they had to do to move there. What papers do you need? What should you bring? Where do you start? How will you get access to your money? As the dollar value turns to your advantage, maybe the time is right for you. The book answers all of these questions while telling a good story. The rest of the book is about living in the northwestern coastal town of Bordighera in the province of Liguria near the French border. You learn about this lovely town off the tourist path and daily life there: shopping, laundry, TV, travel, the doctor, public transportation (they had no car) and more. It's easy to see yourself in this place--you can share the adventure while getting an idea if moving to Europe would be a good choice for you. Readers also go with the couple on several short "road trips" to small towns in Italy, as well as Rome, Paris, Venice and other places in the South of France and Switzerland. It's not a definitive travelogue with a "laundry list" of things to do, it's just an easy-to-read account of what these places are like. A lot of pictures make the adventure even more entertaining. See the book's web site, http://makinglimonta.com/, for more about the book and to see some excerpts.